Michael Atherton plays a myriad of ancient and modern musical instruments from the didgeridoo to the synthesizer. He is a musician, composer, and author of books on music, including Australian Made ... Australian Played, a book about Australia's musical instrument makers. As well as performing, Michael is in demand as a composer for films. He has many credits and has received a number of nominations. Michael Atherton Australian Made ... Australian Played Sounds Australian ???? ???? David Blonski plays didgeridoo and Indian flute on his latest release "On Wings Of Eagles". Didj, trip hop/house beats, found sound, flute & sax on a couple of tracks. Alan Dargin was born and raised in an Aboriginal tribe in Australia's northeast Arnham land. He began studying the didgeridoo at age five. Dargin's grandfather taught him how to play, passing on secret techniques which have been passed down for generations over the instrument's 40,000 year history. Dargin's primary didgeridoo is over 100 years old and was given to him by his grandfather. It is made from the branch of a eucalyptus tree which is naturally hollowed out by ants that hatch under the bark and burrow into the wood. The didgeridoo is decorated with Aboriginal tribal markings and was originally used in tribal ceremonies to induce Dreamtime. Dargin still plays ceremonial music, but never for the public. It is forbidden by custom. Dargin has toured extensively in Australia and the US and has performed with the London Symphony Orchestra at the Royal Albert Hall. Most recently, he toured Korea on behalf of the Australian Foreign Affairs Department. He has appeared in a number of Australian films and has also found the time to earn a science degree from the University of Toronto. Bronze Age Irish Horns have been recovered from many parts of Ireland. Dating from approximately 1000 to 800 B.C., their casting and design represent one of the high points of Bronze Age craftsmanship and technology. Although Bronze Age horns have been in museum collections since at least 1750, it's only recently that the method of playing them has been rediscovered. In 1988 Simon O'Dwyer dicovered that Bronze Age Irish Horns can be played with the same techniques used to play the Australian Aboriginal didgeridoo. The members of Reconciliation are Irish musicians Simon O'Dwyer and Maria Cullen on Bronze Age Irish Horn and percussion respectively and Australians Alan Dargin and Phillip Conyngham on didgeridoo. Bu-Baca Diop was born in Senegal and is currently resident in Sydney, Australia. Alan Dargin appears on two tracks of Bu-Baca Diop's CD Stand. Australian composer and musician Vicki Hansen has been a musician since the age of four, having learned a variety of different musical instruments as a soloist and in orchestras and bands. She has been involved in numerous musical and theatre projects as both a performer and a musician. Vicki has composed sountracks for plays, videos, and short films and recently co-wrote the music for the highly popular ABC rural affairs program 'Landline'. Alan Dargin appears on two tracks of Vicki Hansen's CD Earth Heart. David Hudson is a member of the Tjapukai tribe in Kuranda, North Queensland. Hudson has performed throughout Europe, North America and the Orient, both as a solo artist and a co-founder of the Tjapukai Dance Theater. Sacred Blueprint is Daniel's newest cd and contains didj, sax, organic percussion, and some vocals. He also has a previous CD out on Raven Records called "Ceremony". Daniel also does a lot of didj workshops and works with schools, everything from preschool kids to adult classes. Daniel lives in the Bay Area, in Marin County. You can email him at dnd@hooked.net and visit his web site at www.hooked.net/~dnd. Born in Devon, England, raised in Uganda, a former musical director of Circus Oz, founder member of seminal acapella world/punk combo Furious Pig, Didgeridoo master Stephen Kent is currently resident in the Bay Area, CA. Stephen's newest release "Family Tree" is a two cd set -- rarities, favorites, and new ambient music from one of the world's finest didgeridoo players. Charles MacMahon is an Australian Aboriginal didj player. He played with the band GONDWANALAND and released the following albums. TRAVELLING was released in Europe by JUPITON BV last year. TJILATJILA is to be released in Europe next month. WIDE SKIES and TJILATJILA are available in North America through HOLBORNE. Charlie is working on a new album for release through SHOCK RECORDS this year. Both LET THE DOG OUT and WIDE SKIES won Australian Music Industry Awards. Charlie is as we speak (6/4/97) performing in Austria. Thanks to Rosalie Menadue for the info. Nomad learned to study the Didgeridoo in the bush lands surrounding his home in Melbourne, Australia. A classically trained musician, he wandered into the Australian bush to find the music of nature. Through his music, Nomad has built bridges between Aboriginal and European- Australian people in hope for a greater respect and understanding of each other. Through his global wanderings Nomad has been able to bring together Aboriginal, African, and Native American song onto this release which represents cultural harmony and equality. American-born Graham Wiggins began teaching himself the didgeridoo while a physics student in Boston during the early '80s. After years of practice and study, he earned his doctorate in physics at Oxford University (he even took his didg to the lab a time or two, in order to evaluate the instrument's unique sonics). It's no wonder he found himself tagged with the nickname "Dr. Didg." Wiggins' post-doctoral education came directly from the streets of London, where he and a variety of musical partners honed their craft as performers and street musicians. In the process, Wiggins' didgeridoo playing became a favorite on the festival circuit and in the UK club scene. It was in his role as founding member of the band Outback that Wiggins first gained the attention of American ears. Critically acclaimed for its engaging and accessible fusion of musical styles, the band topped Billboard's World Music chart with the Hannibal albums BAKA (1991) and DANCE THE DEVIL AWAY (1992). After Outback's break-up, Wiggins journeyed to Australia's Elcho Island where he perfected his advanced didgeridoo performance techniques by living and studying with Aboriginal masters. Upon his return to the UK, he joined former Outback percussionist Ian Campbell and fellow Oxford graduate, guitarist Mark Revell, to form the group that would bear his nickname. 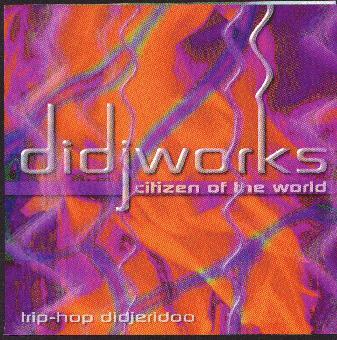 After roadtesting their material on the European festival circuit and in England's renowned rave scene -- perhaps the last place you'd expect to find a didgeridoo -- they recorded OUT OF THE WOODS in 1994. Mandawuy Yunupingu, an aborigine, was pronounced Australian of the Year for 1992 by the Australian government, in recognition of his accomplishments in the national and international arenas. Mandawuy is the leader of the group Yothu Yindi, hailed by Billboard magazine as "the flagship of Australian music". He is one of his country's foremost cultural ambassadors. His band swept the awards of the Australian music industry and played at the United Nations to inaugurate the Year of Indigenous Peoples in 1993. Rhythm Music Magazine, April/May, 1994. I don't play the didj (although that might soon change, now I've received my review copy of Chris Adnams' How To Play The Didgeridoo video) I don't own one, I don't know anyone who owns one, I don't teach, I don't know anyone who does teach, so don't ask me. Why not check Yahoo? Where can you purchase one or more of the CDs listed above? Well, you might want to special order them from your local independent CD store. This has the additional advantages of supporting a small, independent retailer, and also notifying the buyer that there is a market for nore than just Commercial Rock And Pop music in your town. Additionally and alternatively, you could contact the record company directly. I have attempted to include links wherever appropriate. Finally, you might want to try an online retailer such as @TOWER or CDNow. Released at Didjfest '96, this video is far and away the most comprehensive and user-friendly visual learning aid for the Didjeridu on the market. Chris Adnam (AKA Yidaki Man) began playing the didgeridoo at the age of twelve. From traditional northeast and central Arnhem Land rhythms, his music now encompasses jazz improvisation and contemporary music. He has studied the didgeridoo with the tribal elders of Northeastern Arnhemland who are the masters of this ancient instrument. And from their teachings he has developed an eight step technique that takes us from basic cheek strengthening exercises to fast rhythm, multi-voiced performance. This hour-long video is so user-friendly that even the total novice can in a very short time get a sense of the excitement and depth of this instrument. The animated play-a-long sequences allow the viewer to rehearse at their own pace following the notes as they dance across the screen. Hi! We are planning a 'Didj Day' to help raise the vibration of Mother Earth. It is going to be held on 21st June 1997 (Summer Solstice) - 12pm GMT at Primrose Hill, London. The aim is to unite as many didgerdoo players as possible in the UK and around the world to help spread the message of love, light and peace. The idea is that people outside the UK organise their own venue. We wondered if you could help us get our message across to a wider audience and to encourage as many didj players as possible to be involved in this celebration to the sun. We don't presently have our own web site and wondered if you could publicise the event on your page. For more information - basically, the didj-day ceremony will be held between 12-1pm GMT (21st June). There is no accommodation involved, we just simply want to get the message across to as many didj players around the world so that they can all do the same thing - wherever they are. The aim is to create a web of vibrational energy uniting our planet and giving back some healing energy to the Mother. If anyone is interested in joining us in London (Primose Hill) - the nearest tube stations (underground) are Bell Size Park or Chalk Farm on the Northern Line. The main contact is a guy called Bear. He is planning to hold this event every year and to get it widely publicised, so hopefully with your help and the help of everyone else, by the year 2000 we will have a major international celebration of didj players. Thanks to kalyana@dimensional.com for the picture of her didgeridoo. "It is a beautiful work done by native Billy Mongrita from the NW Territory." You have been visitor since April 16th, 1997. Last updated September 20th, 1997.